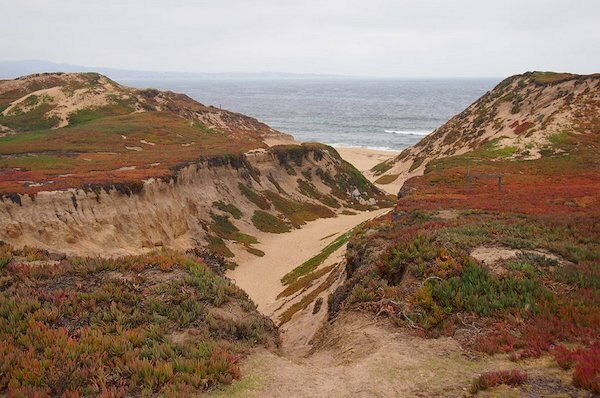 This State Park has a 1,500 foot trail to 4 miles of ocean beach with beautiful views of Monterey Bay. From the parking area visitors may also take a stroll on the new boardwalk to a bluff top viewing platform. Eight educational panels have been installed that will inform the public about the natural and cultural history of the park. Existing park roads are open to bicyclists, hikers and dogs on leash. There are several miles of roads and trails in the park that are good for running and cycling. The beach is also runnable. Park entrance at the 8th Street overcrossing of Hwy 1.